A detailed account of the traditional construction of a canoe on the tiny island of Annobón, an activity that gathers the resources of the entire community, opens By Night the Mountain Burns by Equatorial Guinean writer and political activist Juan Tomás Ávila Laurel. Immediately we are drawn into an engaging, personal, conversational tale. The narrator is a deeply sensitive, if not well educated, man. His voice is fresh, at times naive, frequently looping back to revisit details, questioning the reader or foreshadowing events but deciding to hold off so that he can best share his childhood experiences, as he remembers them, on this remote island where natural resources are limited, life is difficult. As a young boy, our narrator, lives in a large home with his grandparents and a number of mothers and siblings. Any fathers have long since disappeared to a land across the ocean, so no necessary distinction is made between birth connections, he sees all of the mothers as belonging to all of the children. His grandmother rules the roost while his grandfather is a curiosity to his many grandchildren. For some reason he has built his house facing the away from the sea and he sits watching the mountain that rises above the town day after day. He does not fish or go down to the beach to visit with the other men. In fact he does not come downstairs at all and the children never see him eat. For our storyteller, the secrets of his his grandfather and a sense of the danger and misery adults must learn to live with begins to become clearer as a series of devastating events sweep his island community, beginning with a fire that starts on the mountainside destroying plot after plot of precious crops and threatening the town itself. Officially a Catholic community, the roots of superstition, folklore and mythology run deep and are intertwined with Christian saints and celebrations. In the wake of the fire, an especially violent act of retribution is carried out against a local woman assumed to be a she-devil, and then, before the community can heal, a plague of cholera sweeps through exacting a devastating toll on the population. Curiously, in this tale in which most characters remain nameless, every adult who dies is named in in full, and a cluster of crosses are inserted into the text to represent the numbers of dead who now crowd the sole cemetery on the island. Magical and evocative in the telling, mixing childhood wonder with reflective adult wisdom, Ávila Laurel introduces a place few will likely have heard of – the island where he grew up. He has been compared to Achebe and Marquez among others, but his account has a much more contemporary edge. When his character speaks of evil on the island, it is difficult not to think of the very brutal reality of the extreme poverty and social inequity that exist in his country as a whole, despite great resource wealth. Rooted in traditional story telling, this is a story for our modern times. It is exactly the type of important story that literature in translation should be bringing to a wider audience and a clear example of the vital role that independent publishers like And Other Stories play in this regard. Finally, Jethro Soutar’s translation from the original Spanish is fluid, maintaining difficulties that the narrator, who is sharing his tale in Spanish, has finding words to express what Spanish cannot capture of his native island language. The quirks and qualities of his oral account are intact, the humour and insight shine through. Quite an accomplishment given that Ávila Laurel’s involvement in a hunger strike against the government of Equatorial Guinea that led to his ultimate exile to Spain added challenges to the communication between translator and author during the translation process. 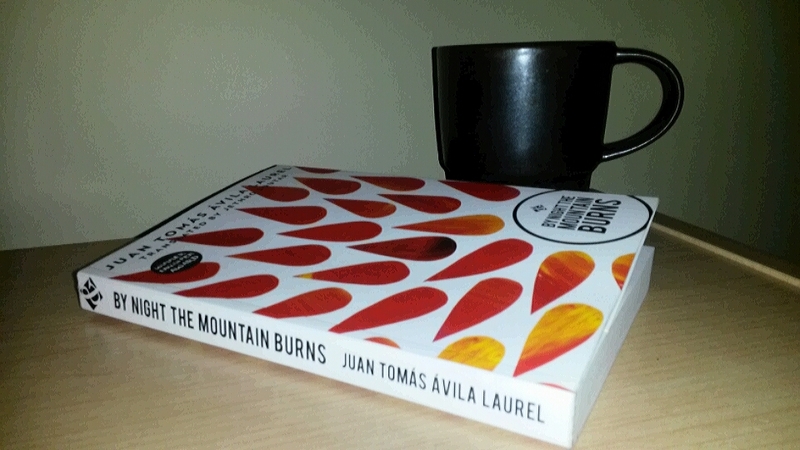 International Foreign Fiction Prize 2015: By Night The Mountain Burns is the first long listed title for And Other Stories, and I confess my bias in that I have developed a great affection for this publisher so I am thrilled. I had in fact just purchased this title along with several others and it was sitting at the very top of my TBR list so it was a happy coincidence that it was selected. Sounds fascinating – I like the idea of blending contemporary and traditional storytelling. I haven’t got a copy of this one yet – hoping to finish sourcing all of the longlist this weekend! I was planning to read this one anyway, I had already bought it so I suspected it would be up my alley. The rest are unfamiliar territory but I am well into Bloodlines and enjoying it. I skimmed your review a bit because I’m planning to read this and I like to not know too much about a book before I read it. But I’m glad to see that you enjoyed it and I’m looking forward to reading it! There are no spoilers in the review but I am reading so many books that I had to get it out of my head before moving on. I generally try to write enough to entice but because this a nominated book my review is a little more formal than I like to write. Enjoy, you can’t go wrong with And Other Stories IMHO. I finally posted my thoughts on this book and have read your review more thoroughly now! Excellent review and I agree with everything you say, even though there were some aspects of the book that bothered me a bit more. Do you have any theories about what was going on with the grandfather? I wonder if I would have a better guess if I knew more about Equatorial Guinea. Oh, I’m sorry to hear that you are in the hospital! I hope your recovery is going well and that you will be home soon. Sorry to be quizzing you about books you read months ago! I just always want to figure out the mysteries in books, though I think maybe in this case the point is not to let you do that. Looking forward to reading this, great review! Thanks! It is wonderful, I love it when translated work really opens doors to places I don’t know. Especially Africa because apart from my obsession with South Africa, I don’t read enough from the rest of the continent. I agree, most of what I’ve read from Africa has been from former Portuguese colonies so I’m looking forward to reading about somewhere different. That’s the beauty of translation! I’ve only read a couple of the IFFP shortlist and wasn’t sure where to start with others. This sounds great and though a new author and publisher to me will look forward to giving this a go! It’s interesting you mention Marquez as your description of this author’s evocative storytelling technique made me think of magical realism and Marquez, in particular. I like And Other Stories, too – they always seem to have something intriguing to offer. This is winging it’s way to me as I type – I hadn’t read much about it so your positive review makes me look forward to its arrival even more. One of the great things about the IFFP is the way it support smaller publishers. Hope you enjoy it! I’m glad to know you are reading it in paper, their books are a delight to hold. And 6 of their titles are supported by subscribers each year so I like the idea of being able to be involved at ground level, so to speak (and see just how long it takes to see a work come to publication). And Other Stories books are beautiful to hold – French flaps, a really nice finish and clear readable typeset. I realize that this book is the type of book I am drawn to more than some and it is a decidedly different form of writing rooted in traditional oral storytelling. I also believe that the less commercial authors who face political risk deserve the attention the IFFP longlist brings.